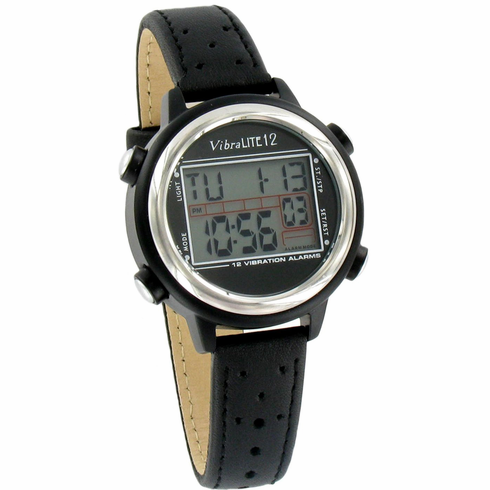 The e-pill VibraLITE 12 Vibrating Watch has 12 daily reminders + 2 Auto Repeat Countdown Timers that can be set. Great for all ages! VibraLITE 12 can help with medication adherence. Large buttons and display screen make it easy to see and set. Text Prompts help you set the watch with ease. The vibration lasts for 20 Seconds on the independent alarms, 5 Seconds on countdown timer 1, and 10 Seconds on countdown timer 2. 12 Hour (AM/PM) or 24 Hour (military time) Clock.